The apple is a sweet round fruit with a central core containing seeds, whilst the bulk of the fruit is comprised of edible flesh, and covered in a thin skin which is also edible. 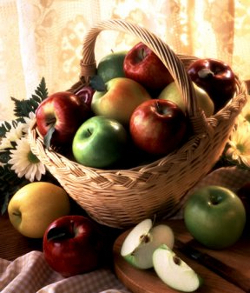 A tremendous number of cultivated varieties of apple exist, as well as many wild varieties not usually picked for sale. The apple is the most popular fruit globally, having more trees in cultivation, and selling more fruit annually than any other fruit currently available. 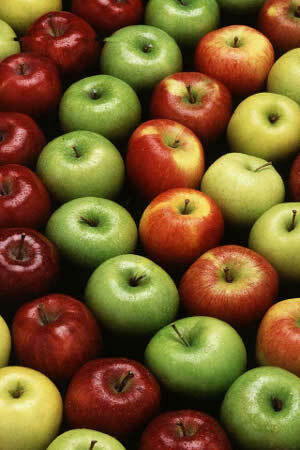 In addition, apples are also juiced and often used within recipes for many other products such as baked goods, preserves and jams, or in some cultures as a sweet additive for spicy foods such as curries. The origins of the apple fruit tree are Asian, specifically in the region of the central west corresponding with modern day Kazakhstan, and archeological evidence locates the Tien Shan mountain forests as the probable origin of all known apple cultivators. Around 10,000 years ago the first human settlements started to form across the near east, India, and further east in China. The ancestor of modern domestic apples, from the tree ‘malus sieversii’, were already known to nomadic peoples from the region and as agriculture started to develop so too did the art of growing orchards, the apple tree being the first to be grown domestically (‘malus domestica’) from seed and studied. We know that 8,500 years ago apples were being grown and eaten in ancient Jericho, a city in the west bank region of the Jordan River. Jericho is considered the oldest city and longest inhabited in the world, with parts of the city dating back 11,000 years making the discovery of apple seeds from 8,500 years ago quite authoritative and giving a clear indication that apples eaten for almost as long as humans have built settlements. We have no evidence that ancient Jericho had orchards as we understand them, and the presence of seeds may only mean that apples were eaten and the seeds spat out, although suggestions are that if apple seeds were being stored then probably apple trees were also being grown. In some parts of the ancient world apples, or at least the best fruit with the sweetest taste and juiciest flesh could only be afforded by royalty and their court, and apples were a popular dessert from as long ago as 4,500 years ago. Hittite peoples were known to favor apples, and the oldest known name for the fruit, warawaras, comes from this time, and their royalty are believed to have enjoyed eating sliced apple as a dessert served on plates by their slaves. An Accadian lady by the name of Puabi, whose mummy was found in the Royal Cemetery of Ur along with the bodies of 5 guards and 13 ladies, was buried with many items of food for her journey to the afterlife, including a plate of sliced apple. Despite these archaeological finds, the first written reference to apples only appears around 3,500 years ago in the Assyrian Kingdom when an orchard containing apples was sold by one Tupkitilla for the sum of three breeding sheep. Sadly the record doesn’t detail how large the orchard was, or how many trees it contained, but it does suggest apple orchards were common enough to be part of regular property transactions. The Book of Genesis, which many scholars believe was written in the time of Moses, around 3,600 years ago, specifically mentions a fruit that is widely believed to have been an apple, and which Satan encourages Eve to eat, thus cursing humanity and causing the expulsion of Adam, Eve, and their descendants from the Garden of Eden. The image of a juicy red apple in Eve’s hand whilst a serpent or cherub speaks to her from the apple tree is a common religious icon, with the tree representing the Tree of Knowledge of Good and Evil. In Jewish religious thought, the tree was mot in fact an apple, instead being a grape or a fig. The Christian era translation of the tree being an apple is most likely an error based on the Roman word Malium which means evil and is very similar to the Roman word for apple, malus. Errors of translation like this are common in many historical documents and unfortunately means we cannot say for certain that the Book of Genesis is one of the oldest sources of apple history, although a similar Genesis story from Sumerian history exists, but the tree is not described, only the serpent. Outside of Judeo Christian religious books, apples also appear as mystical fruits capable of providing eternal life to those who inhale its fragrance as they pass from the world of the living into heaven. Aristotle, the Greek philosopher is widely reported to have smelled an apple’s aroma only moments before his death, and the apple is credited with releasing his soul. In Islamic popular legend, the prophet Mohammed was himself offered an apple by an angel, and told that if he breathed the aroma of the apple he would be assured of eternal life in heaven. Moments later the prophet breathed his last breath. In medieval times apples were common throughout Europe and available to all, though orchards that grew the best fruit only sold their apples to those who could afford them, or were owned by the nobility and church, so were never sold and theft of these was punishable by death or imprisonment. By all account the quality of fruit available varied considerably depending on he experience and skills of the orchardist. During these times it became a custom for nobility to give several baskets of apples to their villagers for the May time festivities, and it was during these times that apple bobbing became a popular activity at local fairs. The foundation of Switzerland in 1291 as an independent confederation is often attributed to an apple, or rather the legend of William Tell who was forced under punishment of death to shoot an apple with his crossbow, the apple being perched on his son’s head. The story goes that the Swiss cantons were invaded by Austrian troops and forced to swear allegiance to the Habsburg crown, something William Tell refused to do. After Tell successfully shot the apple his fame spread throughout Switzerland and resulted in an uprising the ejected the Austrians. Swiss people are even today still proud of William Tell’s exploits, but sadly no proof of his existence has ever materialized. By the 15th century, and the first editions of many English dictionaries and encyclopedias apples, or appylls as they were then spelled, were considered to be not just a fruit for eating but also a medicinal fruit capable of helping cure nay number of ailments. Sniffing a very ripe sweet apple was particularly believed to have helped cure an illness known as the sweating sickness. William Shakespeare mentioned apples in many of his sonnets and plays, such as the invitation to Falstaff to eat ‘a pippin and a dish of caraway’. 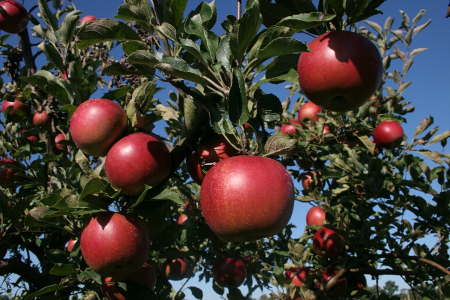 A pippin is a red and white variety of apple much favored in England during those early days of the reformation. In the United States the most famous mention of apples in popular culture is the story of Johnny Appleseed, a Massachusetts born eccentric who travelled for forty years around the states of Illinois, Indiana, Iowa, and Ohio giving small bags of apple seeds to anyone he met who was traveling to the new west. Born John Chapmen, he was a devout man who considered it his duty to help spread the Lord’s message, and who believed passionately that if America was filled with apple trees then no man, woman, or child would ever be hungry again.